People often say that the San Francisco Bay Area doesn’t really have seasons. Weather-wise, they have a point – we have wet and dry, nothing nearly as dramatic as New England, for example. But for those who obsess about local food, there are scores of seasons, each one marking the appearance and disappearance of certain foods at the farmer’s market. Summer, for example, is eggplant season. Farms like Riverdog, Lucero or Vang have great piles of eggplant – not just the dark purple globe, but varieties that are thin and long, some that are Haas avocado-sized, some that are as tiny as a lime, with colors that include pale green, white, light purple, and white speckled with lavender. When their name is unknown, it’s easy to fall back on a geographical description: Japanese, Philippine, Italian, Thai. For one of my new favorite eggplant recipes, I choose the Japanese type, a slender fruit with an inky purple that is almost approaching black. Elizabeth Andoh’s latest book, Kansha: Celebrating Japan’s Vegan and Vegetarian Traditions contains a pair of recipes that knocked me over the first time I tried it. The underpinning is the Japanese philosophy of ichi motsu, zen shoku, which means one food, used entirely. 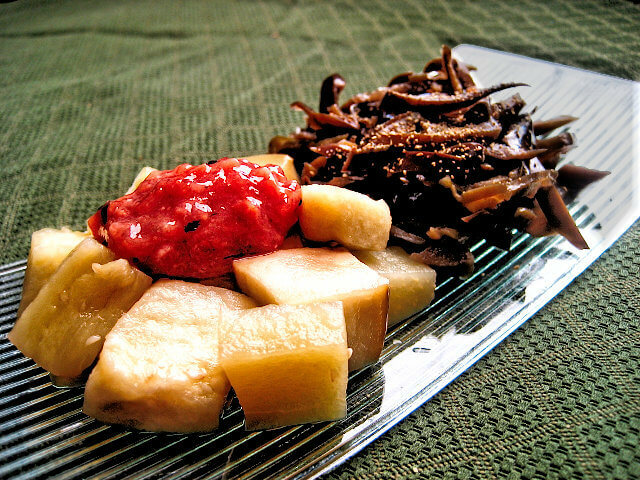 An example of this philosophy is on the cover of the book and in the introductory text, where Andoh explores the daikon: the leafy tops can be cooked and tossed with rice; the root section can be divided into three parts, with each section being cooked a different way or made into a pickle; the peels can be used in soup or in a stir-fry. The recipe I adapted below is for eggplant – separating the flesh from the skin, cooking each element in a different way, then serving them side by side. The flesh is simmered in some lemon juice, stock and saké; the skin quickly stir-fried in fragrant sesame oil with soy sauce and saké. The end of eggplant season is not far away, so if you like eggplant and Japanese cuisine, make haste to give this interesting approach a try. An interesting treatment of eggplant: after separating the eggplant into its inside and outside, they are cooked separately. The inside is topped with a pickled plum sauce (see separate recipe). Wash the eggplant and cut off the stem end. With a sharp knife, peel each one from stem end to flower end, making strips of peel that are about 1/8 inch thick (and ideally 3/4 inch wide). Cut the peel strips into matchsticks that are about 1 to 1 1/2 inches long and set aside in a bowl. Cut the flesh into 1/2-inch cubes and set aside. Combine the lemon juice, squeezed lemon shell, stock, and saké in a skillet or sauce pan that is wide enough to hold the eggplant pieces in a single layer. Add the eggplant and toss with the liquid, then arrange in a single layer. If you are using kombu, place it on top of the eggplant as a lid. If not, cover with an otoshi-buta, a lid with a diameter less than the pan, or a circle of parchment paper. Turn the heat to medium-high. When the liquid starts to bubble, lower the heat to medium-low and cover the pan with a regular lid. Let the eggplant steam for a few minutes until tender. Remove the pan from the heat and let the eggplant cool with the lid in place. If not using immediately after cooling, refrigerate. Heat a skillet over medium heat. When hot, add the sesame oil, swirl to coat the pan, and add the peels. Stir fry for about a minute. Distribute the sugar over the peels and stir. Add the saké, stir well, and continue to stir fry until the saké has evaporated. Add the soy sauce and mix well. Remove from the heat. Let the peels cool in the skillet. When cool, sprinkle half of the kona-zansho on top and mix. If not using immediately, refrigerate. Prepare individual servings by placing a small mound of the cooked flesh on one side of a small plate or shallow bowl next to a small mound of the cooked skin. Place a small dollop of the plum sauce on the flesh. Sprinkle the remaining 1/16 tsp kona-zansho onto the peels. Serve at room temperature or chilled. Mizu amé – a thick syrup made from barley (with English language labels often reading “barley malt”). Vegetarian stock – an infusion of kombu seaweed and shiitake mushroom stems (or pieces of mushroom cap). A simple method of making a stock is described at the bottom of this my post about kabocha squash simmered with lemon. Pit and mash the uméboshi. Mix with the other ingredients. Taste and adjust with more sweetener if needed (the saltiness or sourness of uméboshi can vary widely between brands). Cover and chill. 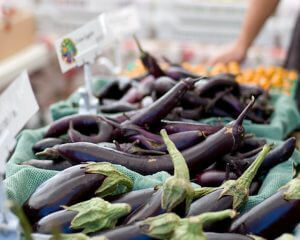 Photo of eggplant at the farmers market by Jen Maiser, from her Flickr collection, used with permission. Photo of eggplant duo by the author.